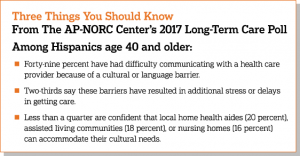 This analysis of The AP-NORC Center’s 2017 Long-Term Care Poll explores the language and cultural barriers older Hispanics face in the health care system and how they can impact care. Many older Hispanics in the United States say they have faced language or cultural barriers as they navigate the health care system, with many experiencing serious setbacks because of it, according to a new study by The Associated Press-NORC Center for Public Affairs Research. Few say they have confidence that local nursing homes and assisted living communities will be able to accommodate their cultural needs. 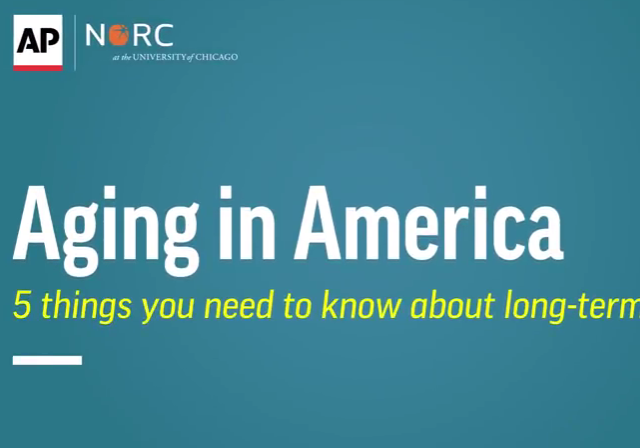 The population of Americans age 65 and older is expected to grow rapidly in the coming decades, with the majority of these seniors likely to require at least some support with daily activities. The Hispanic population in particular is expected to make up an increasing proportion of those age 65 and older in the coming years. 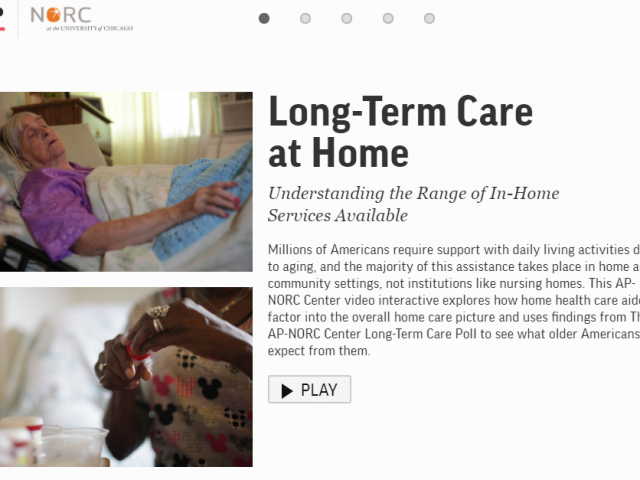 To continue its study into the long-term care experiences of American families, The AP-NORC Center conducted its fifth-annual Long-Term Care Poll in 2017. This study, which includes an oversample of older Hispanics, explores attitudes about ongoing living assistance and expectations and experiences with the health care system. Hispanics may face additional obstacles in getting culturally competent care that other Americans may not. This study reveals that 49 percent of older Hispanics have already faced language or cultural barriers as they navigate the health care system. These barriers have resulted in additional stress, delays in getting care, increased time and effort, not getting needed care, and higher than expected costs for care. 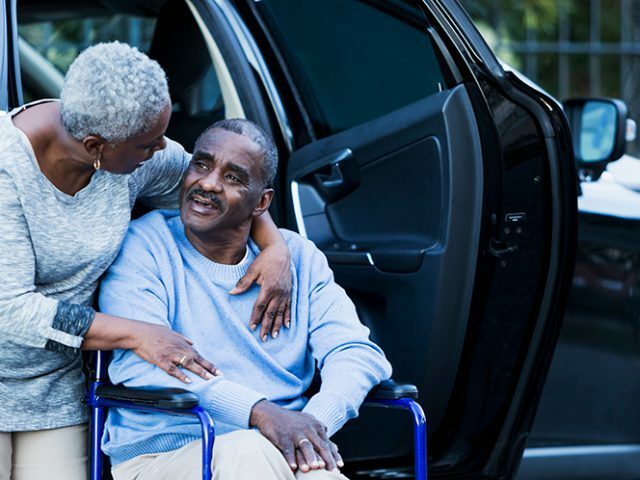 And while most who have either provided, received, or paid for long-term care describe feeling respected and valued throughout their experience, some express feelings of frustration, loneliness, and confusion. Additionally, this study finds that older Hispanics are concerned about how well their local health care services will accommodate their cultural needs, particularly long-term care services. 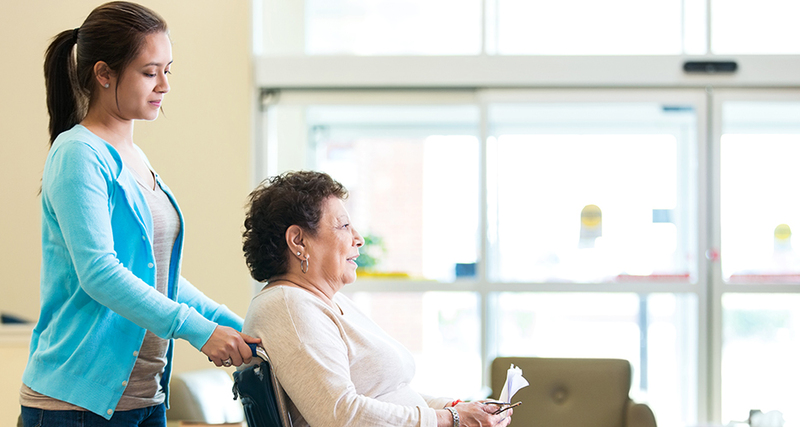 Few Hispanics age 40 and older have confidence in the ability of local nursing homes and assisted living communities to meet these needs, though more say general practice doctors, home health care aides, hospitals, and health care specialists are up to the task. The nationally representative survey of 1,341 adults age 40 and older includes an oversample of 310 Hispanics. Interviews were conducted between March 2 and March 29, 2017 on NORC’s AmeriSpeak® Panel. By focusing on the experiences of Hispanics age 40 and older in their encounters with the health care system, their feelings about these experiences, and their expectations for how well the health care system is set up to accommodate their cultural needs, this study provides the perspective of a critical group of Americans as the country shapes its approach to addressing the mounting long-term care needs of the population.